Religion, Politics and Human Rights – For Christians, To be Born Again in Islam! So Saul summoned the men and mustered them at Telaim—two hundred thousand foot soldiers and ten thousand from Judah. Saul went to the city of Amalek and set an ambush in the ravine. Then he said to the Kenites, “Go away, leave the Amalekites so that I do not destroy you along with them; for you showed kindness to all the Israelites when they came up out of Egypt.” So the Kenites moved away from the Amalekites. Then Saul attacked the Amalekites all the way from Havilah to Shur, near the eastern border of Egypt. He took Agag king of the Amalekites alive, and all his people he totally destroyed with the sword. But Saul and the army spared Agag and the best of the sheep and cattle, the fat calves and lambs—everything that was good. These they were unwilling to destroy completely, but everything that was despised and weak they totally destroyed. Many read violence in the verses of the Holy Quran also. However, it is misinterpretation of the veres advocating defensive war, whether these are misinterpreted by the Jehadis or the Islamophobes, is irrelevant to the comparison of the scriptures. However, the separation of Mosque-Church and State becomes a necessity, in Muslim Countries, in the West and in Israel, in the case of the Bible because of the violent nature of the text and in the case of the Quran because of lack of insight of the power hungry Mullah, the fundamentalist Muslim clerics! It is important to study all religious and political traditions side by side and not focus on the dirty laundry of one particular tradition as that only confirms ones prior prejudices and biases. “All the distinguished guests: Assalamo ‘Alaikum Wa Rahmatullahe Wa Barakatohu – Peace and blessings of Allah be upon you all. First of all I would like to thank all of the guests who, despite not being a part of our religion, are attending this event taking place within our Annual Convention. This programme today has been organised specifically for our non-Ahmadi friends, and indeed the majority, or at least quite a number of guests, are non-Muslim. Certainly, your attendance at this event demonstrates your broad-mindedness, whereby as citizens of Germany, you appreciate that it is important to understand and recognise each another, irrespective of religious differences. A large majority of the Ahmadis in Germany are not of German origin. In fact, apart from just a few people, the vast majority are of either Pakistani or Asian origin. This shows that not only have you come here irrespective of religious differences, but also irrespective of national and cultural differences. It is said that some of Germany’s indigenous population has Asian ancestry. It may seem that many of the world’s nations are divided by their cultures and languages, but the truth is that their cultures and languages often have common roots. If we look, for example, at the case of the Indo-Pak sub-continent, we observe that for a very long period various nations came and inhabited its lands. If we look just at Pakistan, we find that dozens of tribes and ‘brotherhood’ systems existed. Over many eras these distinct groups came to form one nation. 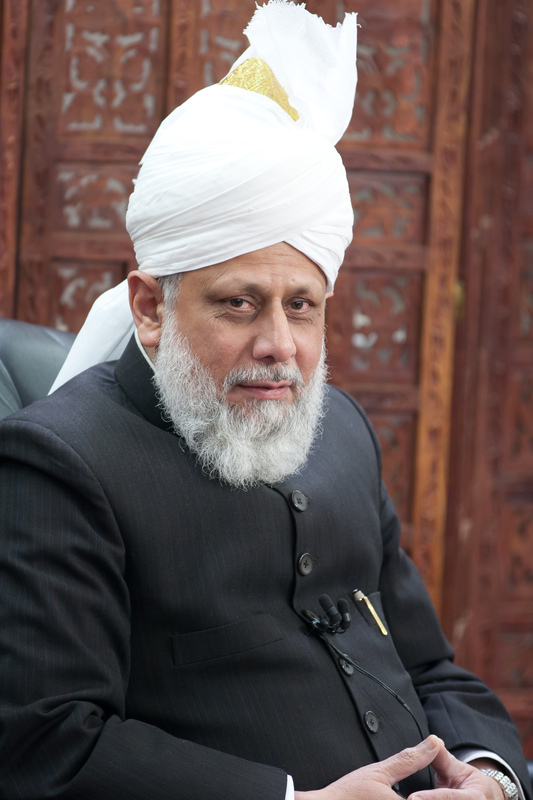 Look at the true picture of Islam portrayed by the Ahmadiyya community. It is on these teachings that you should base your judgement. In one verse, the Holy Qur’an teaches us that: there should be no compulsion in matters of faith (Ch.2:V.257). Some of you may not be aware that this verse was revealed when the Holy Prophet of Islam (saw) had already established a government in Madinah. At the time, a covenant had already been made with the Jews and other tribes, and a functioning system of government was in place in which the Holy Prophet (saw) had already been accepted as Head of State. The injunction to keep religion and government independent of each other was revealed at that time and in those circumstances, even though the difference between right and wrong had become manifest, and even though the Muslims believed their religion to be true and their teachings to be unparalleled. With this injunction it became clear that these excellent teachings were to be spread through love and affection, rather than by force or by acting unjustly towards others. Allah has said that a requirement for a just government is that it should separate religious matters from matters of State, and every citizen should be afforded his due rights. This is the key principle to running a government, that religion should play no part in it. Religious differences should not be an obstacle to the implementation of justice. Umar Farooq: Who pioneered religious freedom for the whole of humanity! The following is a slightly modified version of a short speech I gave in Vestal High School, New York to show that Islam is a religion of peace and that revelation has contributed in a big way to human knowledge and history. By mentioning Churches and Synagogues before Mosques, the revelation was laying the foundation of genuine religious freedom for the whole of humanity. We visited Spain during the spring vacation this year and went to the central mosque of Cordoba, which was a mosque at least for three centuries, but, it is now a Cathedral. In the year 1492 when Columbus discovered America, not a single Muslim was left alive in Spain, either converted on the point of sword, banished or killed. Next year perhaps we will visit Turkey and go to Hagia Sophia, which is a former Cathedral, later a mosque, and now a museum in Istanbul. From the date of its dedication in 360 until 1453, it served as the Greek Patriarchal cathedral of Constantinople. The building was a mosque from 1453 until 1931, after Constantinople fell to the Ottoman. This is what groups did to the places of worship of others, the so called enemies, in medieval ages! But, now I want to share something more dramatic with you. I want you to come with me and visit the holy land of Jerusalem. If you have been to Jerusalem you would have visited the Church of the Holy Sepulchre, one of the Holiest places in Christianity. The site is venerated as where Jesus was put on cross, and is said also to contain the place where Jesus was buried. It did not suffer the fate of the Mosque of Cordoba or the Hagia Sophia because of the generosity, wisdom and religious tolerance of one man Umar, who was the second Caliph of Islam and a very close associate of the Holy Prophet Muhammad. Jerusalem was under Muslim rule from 638 until the creation of Israel in 1948, except for a period of 80 years between the First and the Third Crusade. Editor’s note: The square minaret of the Mosque of Umar next to the Church of the Holy Sepulcher, very powerfully established Islamic belief in freedom of religion and puts to rest, the accusation, for all periods to come that Islam was spread with sword. Islam was actually the pioneer of religious freedoms as I have demonstrated in many of my articles and posts. For the Muslims the political struggle was always divorced from the freedom of religion. I want to take an encyclopedic approach on this all important issue, readers are encouraged to pace themselves or use the materials as reference. Spain: Meeting of the East and the West! Honoring 9/11 victims in our global village! Is Barrack Hossein Obama a Muslim? This article examines the root cause, regardless of the religious or the political affiliation of the perpetrator. Should women have the choice to choose their dress? This is a work under progress! The author, Abdul Haq Compier, is a student and a scholar of Christian history and a recent convert to Islam. Trinity and other dogma at the point of sword: Christianity drips with blood! Constantine I: did he hijack Christianity? The veil, Hijab or Burqa? I was very happy to see the rescue of the 33 miners in Chile, in October of 2010, after an ordeal of more than two months…. Blasphemy Laws: Parallels with Heresy, Inquisitions and Crusades!